Do you remember the “visible body” models we had as kids? You know, the little guy with his organs exposed… you were supposed to be fascinated by the science of it all when your grandmother gave you one as a birthday present, but instead you said, “I wanted a GI Joe”, embarrassing the living daylights out of your mom. 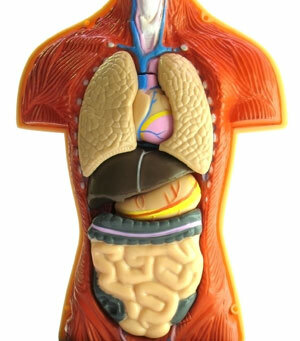 Anyhoo, if you remember, they were pretty limited; you could pop out the liver, the lungs and the heart, maybe the eyes if your Grandma offered you the high-end model (mine didn’t), but, well, let’s just say that it was a dive into human anatomy at the uninterested 6 to 10 year-old crowd level. Let’s fast forward now to the 21st century and imagine what could be done with the same concept, but using the power of the web, 3-dimensional modeling and one heaping dose of serious. What do you get? This interactive, 3-D, web-based program is still in Beta, but already the potential is enormous! According to its developers, the current setup is designed for use at an undergraduate gross anatomy course level, which may be a bit generous as a description, at least for the moment. But for us non-doctors, there’s already a (very) good amount of information, and it’s all free. You will be asked however to create an account and I recommend that you use your junk-mail address, as they are sufficiently honest to say “We collect personal information on this site” right on the home page. They’re currently staying a little vague as to the future of the project. I think even more detailed models are to come, but they may be pay-for additions. However I do get the impression that the basic model will stay free for use. As I mentioned, it is a Beta, and it will be interesting to see what happens as the project evolves. I for one would like to see a little bit more precision in the tissue rendering and especially the addition of a regional anatomy function; currently you only have the choice of a system-based approach. Also, certain systems are not yet complete. For example, the lymphatic system does not go any further than the thymus and the spleen; no lymphatic vessels or nodes for the moment. But already, I know of no other web-based human gross anatomy tool that gives you this level of overall performance, at least not for free. Be sure to watch the introductory video here. It’ll save you a bit of time when you fire up the puppy for the first time (fair warning, I managed to spend half a day on the website!). The program currently runs in and is compatible only with the Internet Explorer browser. Upon installation, two plug-ins will also be added: a Macromedia Flash Player and the Anark Client version 4. The latter will appear in your Control Panel and in Add/Remove programs. Don’t delete it thinking it’s just junk! Thanks for that!! Love exploring anatomy related stuff.. There is a new updated version that is compatible with firefox and Macs now as well as additional anatomy. If you would like to post an image from the application, there are some available on the website.